It has been a rainy week! It started raining the day after I posted about not getting any rain! And, it has not stopped. It has rained or stormed for about a week a little each day. 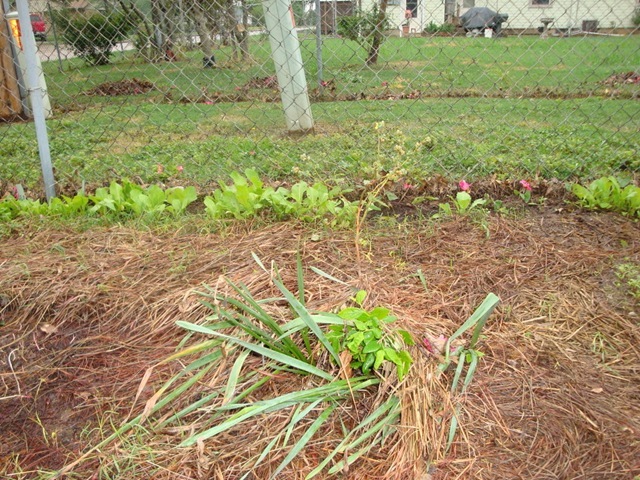 I have not been in the garden very much what with the rain and school starting for the kids. One would think that with the girls out of the house for most of the time, I would be able to work in the garden! The few times I have been out there I pulled up overgrown marigolds and checked for ripe tomatoes. Still no ripe tomatoes! Oh well! My fall tomatoes look great and I think they will ripen before the ones that have been in the garden all summer will. 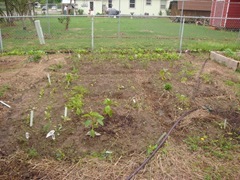 The community garden is coming along. We have a meeting with the city to request a donation of a water meter; after that meeting we will start entering grant proposals. Then we wait…. So long and good gardening in your neck of the woods! I realized after it was posted that the pictures in the former blog did not really match up with the descriptions. Sorry. 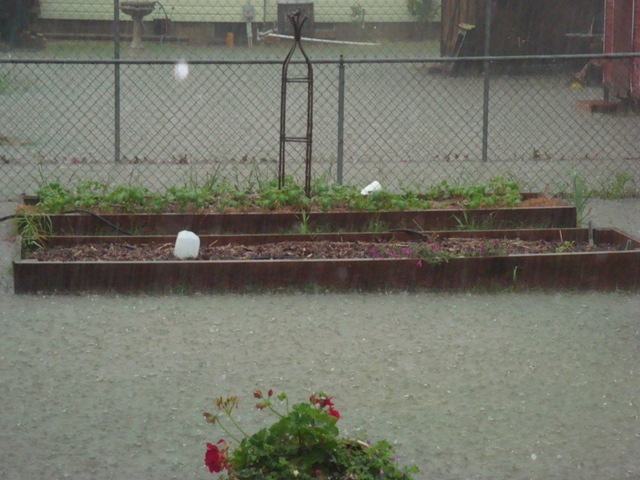 Let’s chalk it down to feeling so crazy Friday while I watched the garden float away. 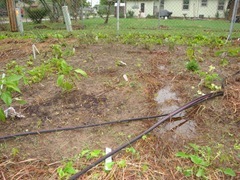 I am posting pictures of the garden in the aftermath. The plants themselves are still there, but the hay mulch, cotton burr mulch, newspaper and cardboard weed barriers and the top 1 – 2 inches of dirt are gone. Actually, it is not completely gone. Some hay piled up against the fence that is still usable. I am surprised it is all still there to be honest. It is a mess! And it smells bad now. 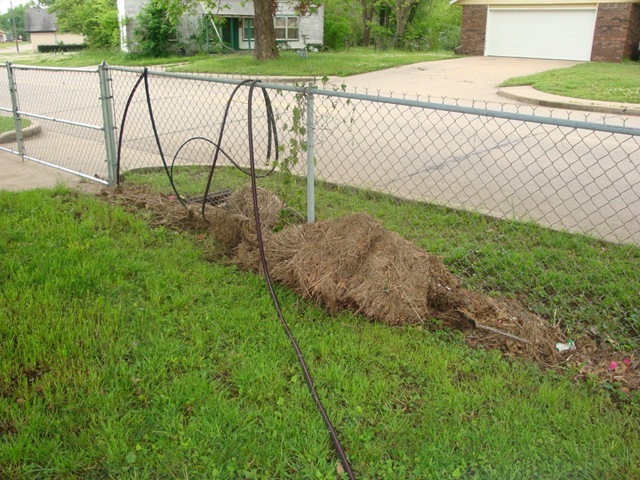 Who knows what kind of junk washed over it from everyone else’s yards and from the street. We really need some sunshine. The tomatoes are stating to turn brown on the edges and look a little wilted. Dad is getting back to me on the problem, though I have a good guess (water anyone?). I hope your garden is going great, and that the sun is shining there wherever you are! 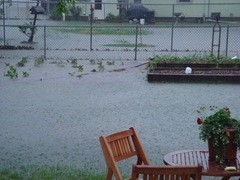 Well, I guess part of gardening and farming is dealing with the whims of nature. 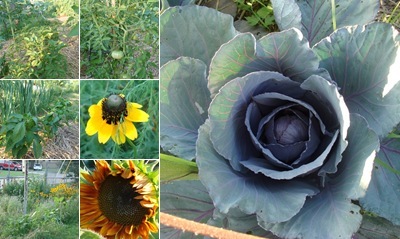 I am posting pictures of my garden. You can see the white shed far in the back right of the picture and the brown smudges to the left of that, those are my raised beds. 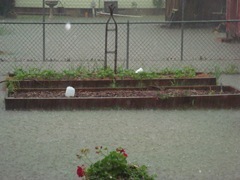 The rest is water which is completely covering my garden. I feel so frustrated. And the really bad thing is it flooded by 8 am today(Friday, May 1) and it is still raining, a lot! The other two pictures are of the streets our house sits on. The stop sign is in my front yard, notice how high the water is on it, and the picture is looking south. 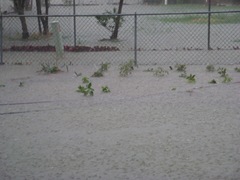 I could not get to my driveway between leaving to take my girls to school and returning. I was gone for about 20 minutes. 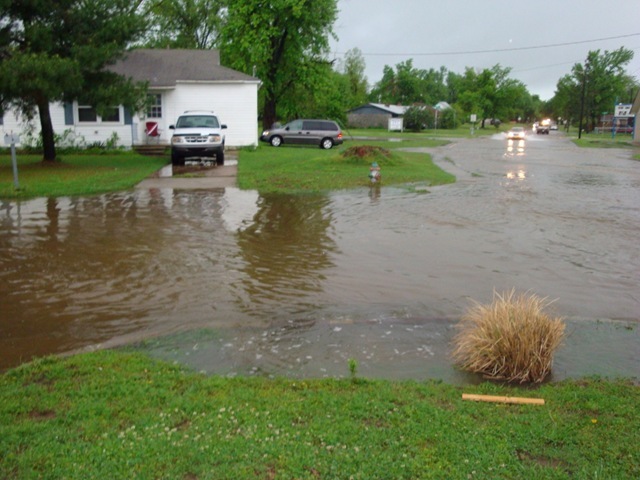 The entire town is dealing with this kind of overflow. It just started pouring down again!!! Aaarrrrggghhhh! PS: The blog was written at 8 am when it happened the first time. 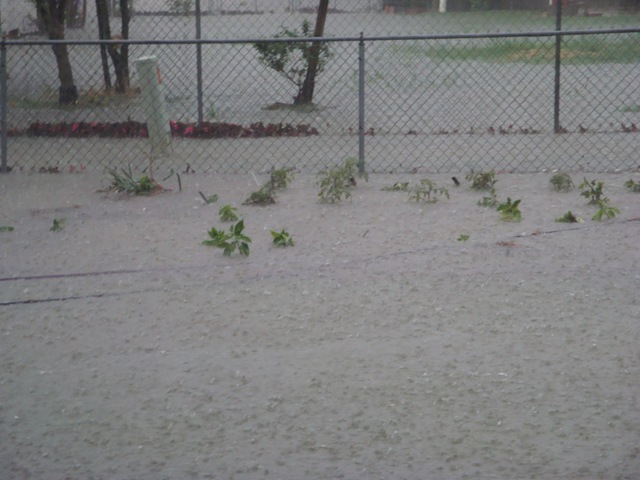 The pictures are from the 10:30 am flood and it is pouring down rain again at 2 pm. We are way behind schedule on getting a garden planted. 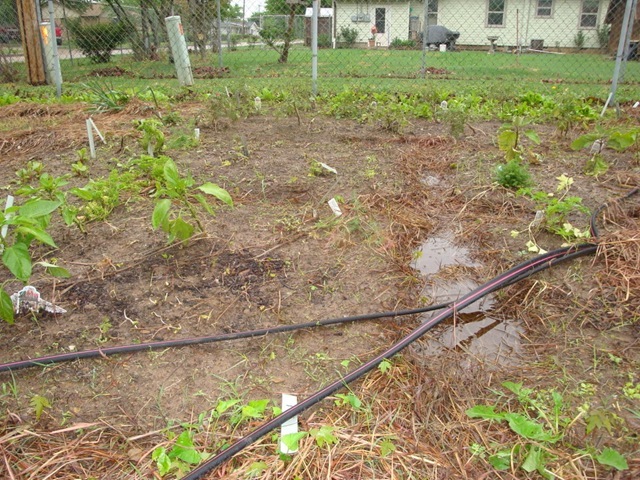 It finally dried out enough that Charley was able to plow last Saturday but the garden still needs to be plowed again and it’s rained nearly every day since. Plus we are almost sold out of vegetables so we may not even have enough to plant. But don’t despair. 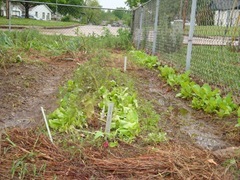 There are other gardens we can look at that were planted in time so we will some gardens to watch and learn with. Yeah! Everything survived the snow! Thankfully, the snow melted the next day and the water has drained fairly well. 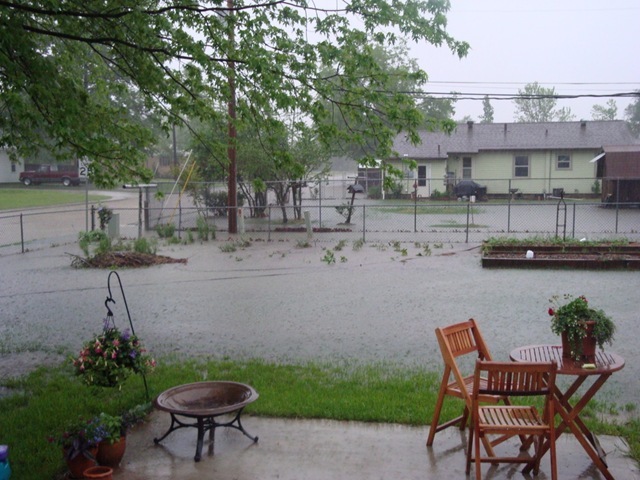 Our backyard turns into a pond with 4 to 6 inches of standing water anytime it rains, so I have been a little worried about everything drowning. But, the garden area seems to be draining much better this year. Everything is looking good and coming up nice and strong. I will start planting tomatoes and herbs as soon as it dries out. Oh yeah, it is supposed to rain tonight too. 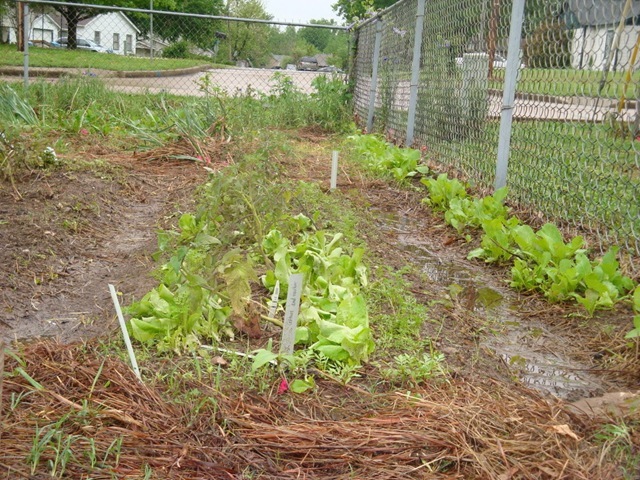 It is time to plant tomatoes and such in most places from Oklahoma on south. If you have dry ground, go ahead and start planting. It might still frost one or two more times but just cover them with paper bags or cardboard boxes or hay or straw and they should be fine. Dad always told me that most plants can survive a light freeze (30-35 degrees F) but the frost will always get them. So make sure they are protected from the frost more than insulated from the cold. As always, have fun! !